Probably the most impressive of Facebook’s connectivity projects is its solar-powered Aquila drone for enabling Internet access in remote areas. But while the technology behind Aquila is impressive, more traditional terrestrial connectivity systems are often still more practical. Today, Facebook announced two new connectivity projects at its F8 developer conference, Terragraph and Project ARIES, both of which focus on using terrestrial antennas — but in very different ways — to exploit different wireless techniques to cover both urban and rural areas. 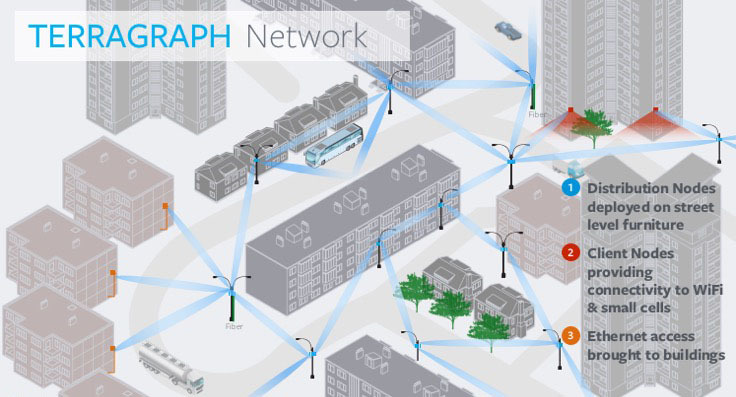 Terragraph equips lightpoles and other “street furniture” with antennas to blanket cities in WiFi, and ARIES packs tons of antennas into a big array to beam connectivity into the distance. Terragraph combines Facebook’s knowledge of software-defined networks (which essentially moves many of the networking techniques that previously required highly specialized hardware into off-the-shelf software tools) and the WiGig standard, which can handle transmission rates of up to 7 Gbits. WiGig uses the 60 GHz frequency band, which is unlicensed in most countries (just like the 2.5 GHz and 5 GHz bands Wi-Fi uses). 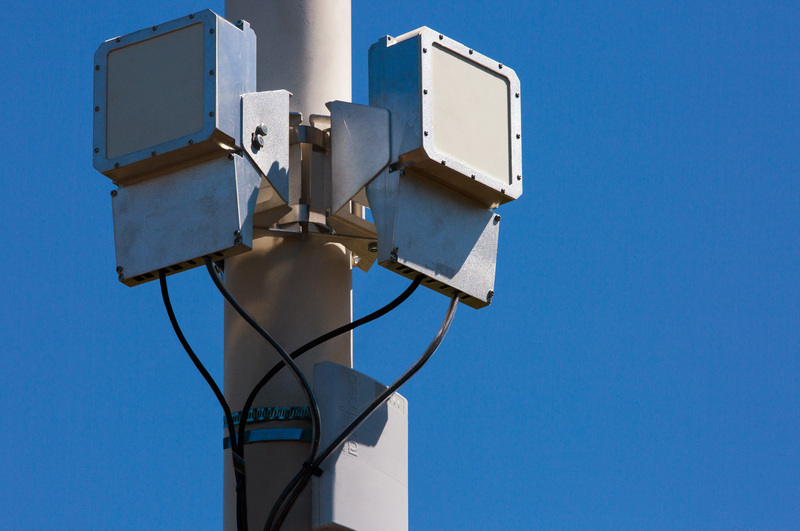 The problem with 60 GHz, though, is that it can’t really penetrate walls, but the signal can travel about 200 to 250 meters and Facebook wants to use these Terragraph systems to offer street-level connectivity in urban areas. In the end, of course, this WiGig connectivity has to be translated to Wi-Fi, which will be the job of WiGig client nodes. As Facebook announced today, it plans to run a pilot project for Terragraph in San Jose later this year. At least some of the work the company is doing on Terragraph will flow into Facebook’s Telecom Infra project. Facebook also notes that a system like Terragraph could be installed outside a high-rise to offer connectivity to a whole building. ARIES, which as you probably already guessed stands for Antenna Radio Integration for Efficiency in Spectrum, focuses on covering larger areas. 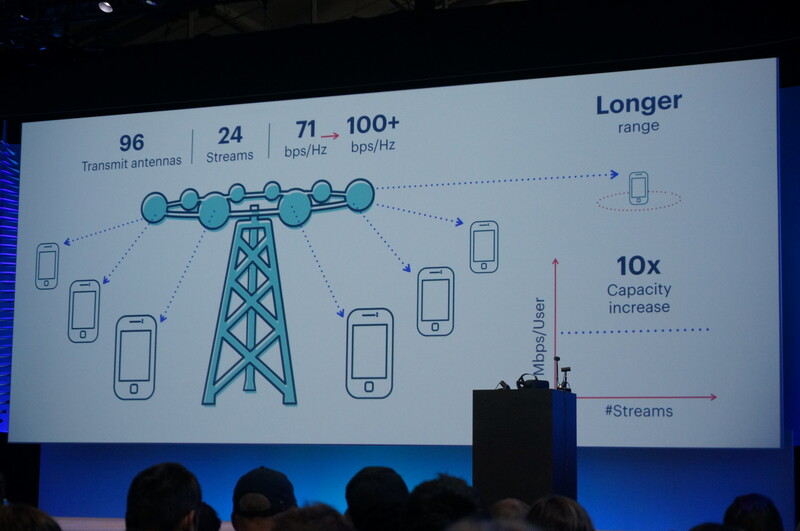 It’s essentially a technology that pushes the 4G cellular standards forward by moving from multiple input, multiple output (MIMO) — that is, using multiple transmitters and receivers to transmit more data — to what Facebook calls “Massive MIMO.” The ARIES test platform currently uses 96 antennas and can support up to 24 devices simultaneously. The company says its ARIES prototype shows 10x spectral and energy efficiency gains over traditional 4G systems. While these systems also work well in urban areas, Facebook says its focus is on making these massive MIMO systems work well for rural areas. The idea here is to use ARIES base stations in urban areas to broadcast out to the rural areas around these population centers and provide a backhaul infrastructure to provide access to areas farther away.